At Las Posadas, the discerning traveler will find a unique, intimate, and sophisticated collection of four villas on two beautifully landscaped acres, located at the gateway to Sedona, Arizona. You will discover the perfect blend of gracious southwestern hospitality and elegant accommodations. Each villa offers five spacious two-room suites, designed and furnished to provide for your ultimate comfort and privacy in a romantic setting. Imagine awakening to a brilliant sky and magnificent red rocks and then hearing the soothing trickle of fountains as you stroll past the native trees and flowering plants to enjoy a scrumptious gourmet breakfast. You will enjoy fun-filled days exploring the natural wonders of Sedona, such as spectacular hiking, incredible vistas, and a breathtaking drive through Oak Creek Canyon. Close by Las Posadas you will find world-class amenities like the Sedona Golf Resort, the Hilton Spa, the Cucina Rustica restaurant, and much more. 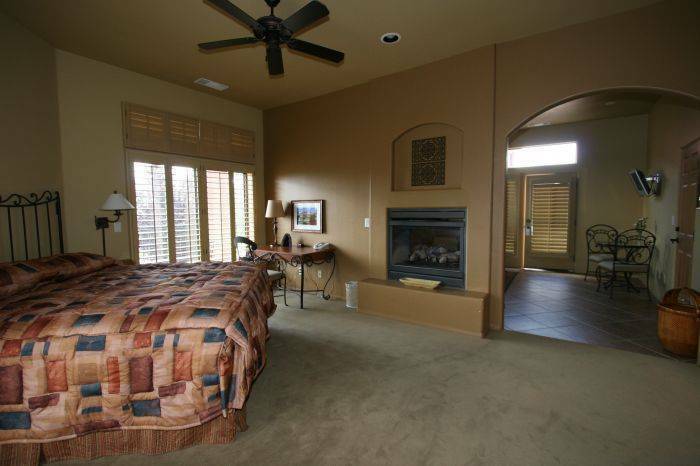 When you return to your suite at Las Posadas of Sedona, relax in your private oasis. Soak in a soothing spa, gaze at the star-studded sky, or savor a glass of wine by your private fireplace. Las Posadas is a sanctuary, a welcoming respite for all occasions. Las Posadas of Sedona is a sophisticated collection of 20 spacious, two-room luxury suites, each comfortably located in one of four Adobe-style villas. Each villa contains five 650-square foot suites with private entrances. Our suites, each twice the size of typical hotel or bed and breakfast rooms, are distinctively designed to bring you Old World charm combined with contemporary luxury and comfort. 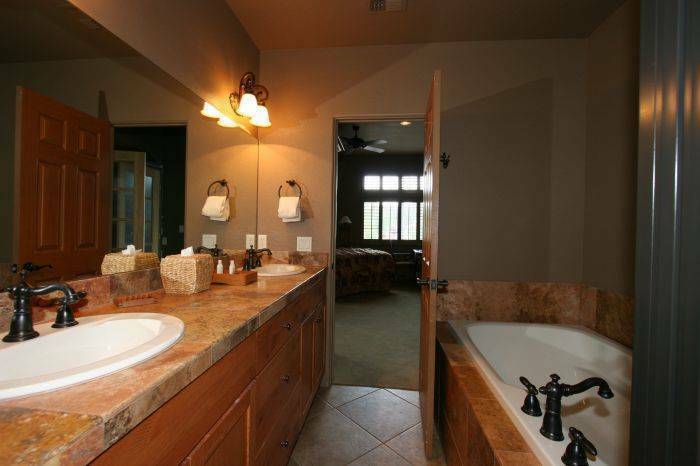 The elegance of Sedona is reflected in every detail, from hand-crafted furniture and custom upholstery, to oil-rubbed bronze fixtures and travertine floors with beautiful deep-red hues. The distinctive villas feature bold colors, warm woods, and sophisticated fabrics to delight your senses. Rich colors distinguish all the suites, from warm blues and greens to deep reds, purples and golds. Complementing the lush interiors are many wonderful views of Sedonas unique red rock vistas. 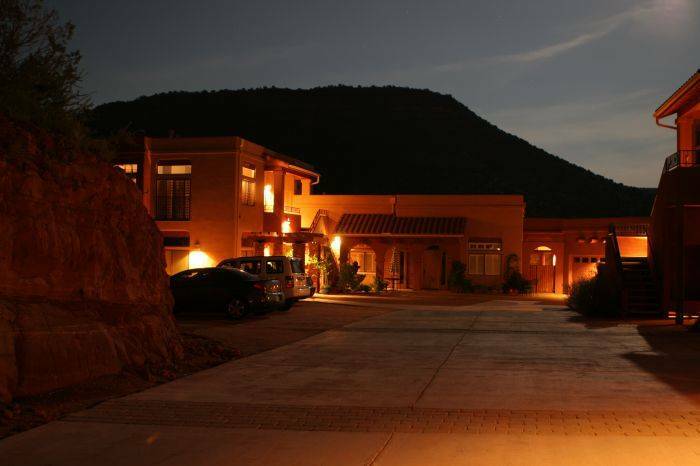 Las Posadas holds the enviable position of being at the gateway to Sedona. You'll be just minutes from everything that makes Sedona famous, including the breath-taking Red Rock landscapes that beckon hikers, photographers, and nature lovers alike. Why not start with the most famous of Sedona attractions? Get up close and personal by walking or hiking the trails through the red rocks. Or take an exciting Jeep or ATV tour on a guided off-road excursion to places youve only imagined! Enjoy panoramic scenery in Oak Creek Canyon, one of the most beautiful drives in America. Its also home to Slide Rock State Park, where the whole family can enjoy hiking, sunning along the creek, or sliding down a slick natural water chute. View 285 acres of Sedonas beauty on display at Red Rock State Park, Red Rock Crossing and Crescent Moon Ranch. Learn about the areas flora, wildlife, geology, and history through videos, exhibits, and guided tours. Hike, bike, climb, play tennis or golf. Imagine enjoying your favorite activities surrounded by magnificent red rocks! 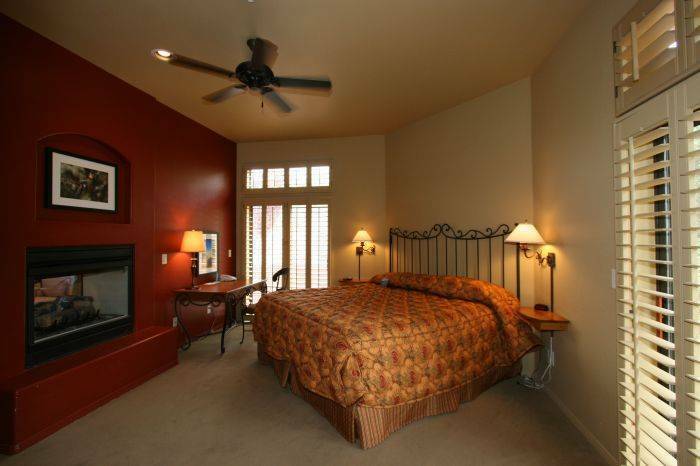 Las Posadas is located across from the Sedona Golf Resort and five minutes from Oak Creek Country Club. Find silence and inspiration at the Chapel of the Holy Cross, an intriguing house of worship built into the red rocks. Experience the mystery of Sedonas vortexes, or simply commune with Mother Nature. Take a scenic ride on the Verde Canyon Railroad Arizona s longest-running nature show! Youll travel along the Verde River, over bridges, and past crimson cliffs into the heart of Sycamore Canyon. Youll find treasures everywhere in Uptown Sedona, the Tlaquepaque Mexican Village, Hillside Sedona, Oak Creek Factory Outlets, and scores of art galleries. Enjoy Sedonas southwest cuisine and unique creations from award-winning chefs. Choose from French, Greek, Italian, Chinese, Thai, Mexican, Indian, Japanese, and other cuisines. Jump in your car or travel by air to more fun in Northern Arizona. Take a day trip to the Grand Canyon, Walnut Canyon National Monument, Meteor Crater, the Painted Desert and Petrified Forest, or many other natural wonders. Or discover other nearby attractions in the Verde Valley, such as the old mining town of Jerome, Tuzigoot National Monument, and Montezuma Castle. All rates are based upon single or double occupancy. Additional charge per person over 2 is $30.00. Weekends, holidays and special events may require a minimum 2-night stay. Rates include our gourmet breakfast, complimentary concierge services, beverages, snacks & hors oeuvres but do not include applicable taxes (currently 6.325%). We regret that we cannot accept pets. Las Posadas is suitable for children 12 & over. For the comfort of others, we maintain a smoke-free environment in the guest suites including the balconies & patios and all other indoor spaces at Las Posadas. Deposits/Payments: All reservations must be guaranteed by a credit/debit card deposit equal to one nights stay for each room reserved. In the event that a minimum stay requirement is in effect for the dates of the reservation, then the deposit will be equal to the number of nights for such requirement. The balance will be due upon arrival. If the reservation is made within 14 days prior to arrival, 100% of the total room charges will be charged to your credit/debit card at the time of booking. Guests must insure the accuracy of the credit/debit card information. In the event that the required deposit is not collected due to inaccurate credit/debit card information, then the requested reservation will not be guaranteed and Las Posadas of Sedona will not be held responsible if the reservation is cancelled. Cancellations: Cancellations must be made 15 or more days prior to arrival date to receive a full refund less a cancellation fee of $75.00 per room. There are no refunds of deposits on cancellations made 14 days of less prior to arrival. Liability: Guests are responsible for causing any damage or loss to our property. Guests are advised that personal items lost or stolen while staying at Las Posadas are not the responsibility of Las Posadas. Guests will have a key for their guest suite and will be solely responsible for locking the guest suite and safekeeping their personal property during their visit. Neither Las Posadsas or its agents assume any responsibility for ensuring that the guest suite is locked and secured during the period of occupation by the guests. Guest shall hold Las Posadas and its agents harmless from all liability arising out of guests actions during their visit. We make every effort to address specific individual needs of which we are made aware. From Interstate 17, take Exit 298 and go north on AZ Hwy 179 for 5 miles. At the first traffic light, turn right onto Avenida de Piedras and then take the first left into Las Posadas of Sedona. The Phoenix Shuttle is an alternative to renting a car.